The Redlands Tigers Lord’s Taverners side have romped to their third victory on the trot to remain unbeaten so far this season. After winning the toss and electing to field first, the Tigers bowlers dominated early proceedings, taking two quick wickets to stun the travelling opposition. A middle order partnership quickly got the visitors back on track, but some tidy middle order bowling from Sam Geyer and Jack Sinfield stemmed the flow. The Tigers began to stray from their tight lines thereafter, but still managed to restrict Darling Downs to a below par total of 217. Stephan Muller (45) and Jack Sinfield (40) picked up where they left off last week, putting together an 81 run partnership to get the Tigers innings off to a flyer. Both openers fell in quick succession as the first drinks break approached, but an unbeaten half-century from Sam Geyer and a quality innings of 70* from Dylan Kritzinger on his return to the side got the Tigers over the line with 7 overs to spare. 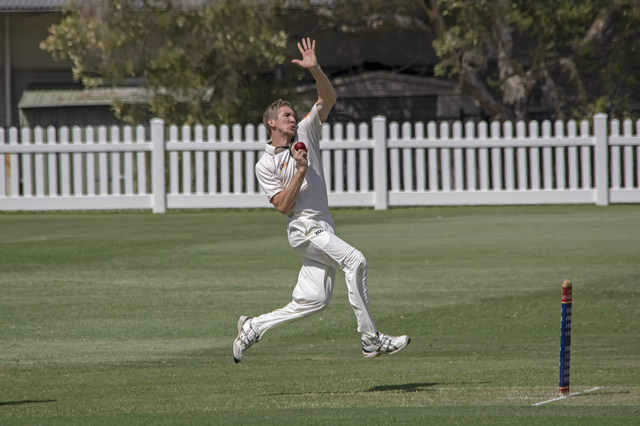 Unfortunately, the Tigers first and second grade sides didn’t match the Taverners efforts in their one-day quarter final clashes with Western Suburbs on Sunday afternoon. Both sides travelled to Graceville with hopes of reaching the next stage of the finals, but fell short of victory. Their two-day clashes with University of Queensland a day earlier were similarly disappointing. First grade were sent into bowl first, with Josh Arnold (3/37) and Ben Long (2/54) the Tigers’ top wicket takers. University declared with 345 on the board, ensuring the Tigers would have to face 7 overs before stumps. Redlands openers Steven Moss and Liam Smith hung on and will resume next Saturday with 324 runs required for first innings points. It was a similar story in second grade, where the Tigers will be chasing 281 for victory next weekend. The bowlers toiled hard throughout the day, but a mammoth partnership for the 5th wicket allowed the visitors to slowly make their way towards their eventual total. Craig Weier (4/64) and Rob Ballarino (3/86) were the pick of the Tigers bowlers. Much like in first grade, the Redlands openers were required to face out a few overs before stumps. Both batsmen got through this period unscathed and will return next weekend with 276 runs required for victory. Third grade were in fine form away from home on Saturday afternoon, and look in a good position to claim victory next weekend. Luke Haegel (4/54) was the chief destroyer of the University top order, while Hassan Sadar (4/24) was also amongst the wickets. The Tigers are 1/30 in reply, requiring a further 101 to claim victory in the first game of the new season. Fourth grade find themselves in a difficult position heading into day two. After winning the toss and electing to bat first, Redlands opening batsman Chris O’Shea went to town on University’s new-ball bowlers, smashing boundaries to all parts of the ground on his way to 50 from 28 deliveries. When he fell with the score on 71, the Tigers could only manage a further 65 runs. In reply, the visitors find themselves 77 runs ahead. Jacob Apted leads the wicket takers column currently with 3 scalps. Fifth grade are in a similar predicament and require several big partnerships if they are to surpass UQ’s first innings total of 183. Alex Ward led the way for Tigers with his first five-wicket haul of the new season, while Matt Short also claimed three important wickets to help dismiss the opposition in the 55th over of play. After a tricky 15 over period to end the day, the Tigers find themselves 5 down for 19. Sixth Grade one are 123 runs away from securing their first win of the season, but will need to do it with just five wickets left in the shed. James Vidal (4/61), Tom Biggs (2/37), and Matt Fay (2/27) were the pick of the Tigers bowlers. Sixth grade two are in a fantastic position after day one thanks to a terrific knock from Tom Gittings. The classy batsman put together a clinical innings of 120* to help the Tigers through to a mammoth first innings total of 274. Damyn Waddups (29), Ben Thompson (29) and Zac Maguire (25) also impressed with the bat. The Tigers will return next week requiring a further eight wickets for victory having already snagged two opposition wickets in the first over of the innings. Sixth grade three wrapped up their first win of the new season against the North Spartans at Marchant Park. The Tigers continued their good work from last week to dismiss the opposition for 106, with Jack Robinson (4/21), Jason Lau (2/12) and Lachlan Ciesiolka (2/20) the main men with the ball. Raghav Goel added icing to the Tigers’ cake with a half century in the second innings.